With Trevor Story, the Colorado Rockies have a bright future at the shortstop position, leaving Jose Reyes without an everyday job in Colorado and a likely spot on the trade block. Jose Reyes is a rapidly declining, expensive and injury prone player, and yet, according to Buster Olney of ESPN, there appears to be a market for the troubled shortstop. 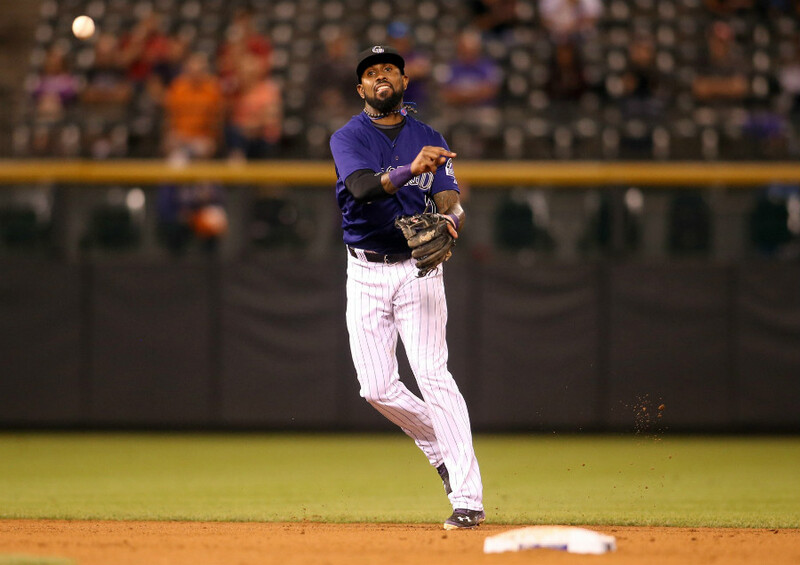 As it stands, Rockies General Manager Jeff Bridich hasn’t made any formal indication that Reyes is on the trading block, but with a crowded infield and hefty salary, it would be a shock if he didn’t listen closely to every offer he receives. The issue, though, is that Reyes is making $22 million this season and is set to make the same in 2017. That’s not the type of salary a club can just offload; the Rockies will have to make serious concessions, like eating a chunk of his salary and receiving pennies on the dollar in return, if they want to get Reyes out of the Mile High City. In terms of a trade partner, team’s that jump to mind include the Seattle Mariners, Washington Nationals, Baltimore Orioles and Atlanta Braves. All four of these teams are either in need of a shortstop or are in the position to take on a hefty portion of the remaining $40+ million on the deal. The Mariners current shortstop is Ketel Marte, and even though he has shown a ton of promise early in his career, it never hurts to add a serviceable, former All-Star to back up and mentor the young one. Reyes could fit in with Seattle like Jimmy Rollins fit in with Los Angeles last season, and that could be valuable in the eyes of the Mariners. The Mariners have also shelled out the dollars in the past, so it wouldn’t be all that surprising if they did so again. Next is the Washington Nationals. The Nationals everyday shortstop is currently Danny Espinoza, who is hitting a pitiful .202 in 2016. That’s not great for a team in position to contend for a championship this season. Reyes could be the final piece of the puzzle for their offense. While Reyes would be an expensive addition to the Nats, it could be the deciding factor from a deep playoff push. Reyes, a career .290 hitter, would slide in nicely for the Nats, bringing an experienced, proven bat to the middle of the lineup. Third is the Baltimore Orioles. The injury bug always seem to bite early in the year, and this year it latched on the Orioles. Baltimore’s starting shortstop J.J. Hardy has a fracture in his right foot which could result in significant time on the disabled list. The Orioles have opted to move Manny Machado to short and play Ryan Flaherty at the hot corner, who is currently hitting below the Mendoza Line. If Baltimore opted to bring Reyes in, they would have a serviceable replacement while Hardy recovers, allowing Machado to move back to his natural position at third. Finally, the pitiful Atlanta Braves. The Braves are not even close to contending, but they have made it clear that they’re not shying away from bad contracts, as long as they get a fine haul in return, and Reyes’ is the worst contract out there. The Rockies would likely have to spice the trade up with some young talent, but it may be worth it if the Braves were willing to eat most or all of Reyes’ contract, giving Colorado some financial flexibility heading into the trade deadline. Remember, it’s only the beginning of May, which means that there is still a ton of time before a decision needs to be made as to whether or not Reyes will be traded. With that said, it seems like Reyes’ days in Colorado are numbered.